In the age of social media, customers increasingly turn to them as a source of information on whether certain beauty products or services are worth purchasing (Immediate Future, 2016, p. 1). According to the 2015 survey by BuzzMyVideos, 85% of British customers aged 16-45 would trust a review by a YouTube beauty blogger over any other advertising medium (BuzzMyVideos, 2015, p. 1). There is evidence that the global beauty industry might be heavily underutilising the potential of social media. In the US, 69% of personal care companies failed to regularly update their websites and 12% did not remove out-of-date promotions (Miguel, 2014, p. 1). 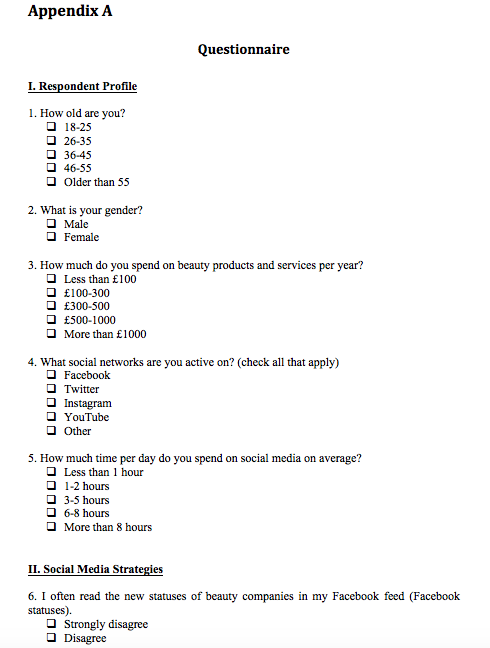 This dissertation aims at testing on whether the situation in the UK beauty industry is better and if their social media strategies are generally effective in reaching customers. The beauty industry, also known as the cosmetics, health and beauty and beauty and personal care industry, consists of the businesses dealing in manufacturing, distribution and provision of cosmetic products and services (CTPA, 2016, p. 1). This sector is strongly dominated by small enterprises, with companies of 1-10 people accounting for 93.5% of the market (Habia, 2016, p. 1). The total worth of the British beauty industry was estimated at GDP17 billion in 2015 (Raconteur, 2015, p. 1). A slightly more modest estimate of EUR16 billion, which was provided by Statista (2016, p. 1), still indicates a high contribution of this sector to the UK economy. The British beauty industry currently employs over 1 million people (Raconteur, 2015, p. 1) and was steadily growing between 2011 and 2016. Overall, its total retail value increased by 14.4% over the past five years (Statista, 2016, p. 1). In January 2016, the retail sales grew by 2.2% year-to-year, with the strongest increase being observed in the segment of health and beauty products (8.7%) (Retail Economics, 2016, p. 1). The online sales rose by 10.4%, indicating the rapidly growing importance of this distribution channel for beauty companies (Retail Economics, 2016, p. 1). Social media advertising and promotion strategies can help beauty businesses take advantage of the emerging opportunities in the online environment. The forecasts of how the UK beauty industry will be affected by Brexit are controversial. The Euromonitor (2016, p. 1) team expected the market growth in the next few years to be slowed down by the political uncertainty and falling GDP. Meanwhile, Morrill (2016, p. 1) pointed out the extremely positive dynamics of the beauty industry during the two past major crises of 2001 and 2008. This effect was first observed by Leonard Lauder, the chairman of Estee Lauder, and received the name of the ‘lipstick index’ (Morrill, 2016, p. 1). The possible reason why the beauty market tends to grow during the overall economic downfall is that purchasing beauty products and services is an accessible way for customers to restore their psychological comforts. In addition, some customers use beauty products in order to look more competent and professional and, hence, improve their earnings and job prospects (Beauty Resource, 2016, p. 1), which also drives up the demand for them at recession times. Besides, the British beauty industry can benefit from the pound depreciation since a significant portion of its customers are located in the euro and dollar zones (Morrill, 2016, p. 1). Social media, due to their global impact, provide a cost-effective way to reach these populations, which is likely to be appreciated by beauty companies in the today’s market environment. This research project aims to explore the impact of social media advertising and promotional strategies on consumer purchase intention in the beauty industry context. To evaluate how consumer behaviour theories explain the connection between social media and customer responses. To identify the social media strategies/practices employed by companies in the beauty industry. To compare the effectiveness of various social media advertising strategies in promoting consumer purchase intention. To develop recommendations for the beauty industry companies on which social media strategies to employ in order to maximise customer outcomes. The main research question is: What social media advertising strategies are the most effective to promote consumer purchase intention in the beauty industry? The following minor research questions are answered throughout the dissertation. Can social media advertising produce negative effects to customer purchase intention? What strategies of social media advertising are employed by companies in the beauty industry? 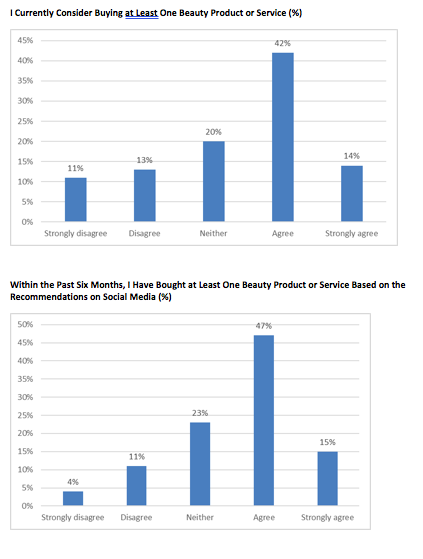 How do customers perceive the social media advertising strategies employed by beauty companies? 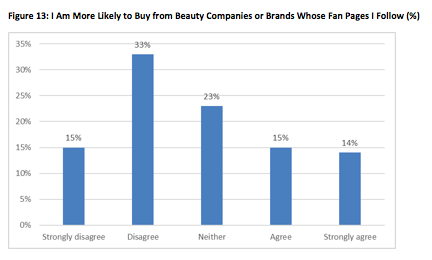 Is the social media advertising by beauty companies effective in generating sales? According to Voramontri and Klieb (2018, p. 22), social media communication primarily contributed to the information search and alternatives evaluation stages of the consumer decision-making model. The analysis of customer behaviours of 158 social media users revealed that people relied on popular platforms to look for information about beauty products. Additionally, they relied on word-of-mouth and celebrity recommendations to choose the most attractive options and evaluate alternatives. At the same time, subscriptions to official brand pages or popular bloggers could also stimulate the recognition of new needs through product and services presentation (Paco and Oliveira, 2017, p. 119). These communication channels stimulated purchase intentions or the decision to search for information about the offerings. 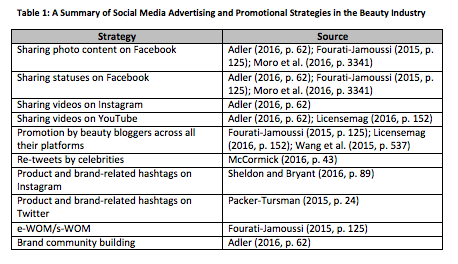 However, the studies of Voramontri and Klieb (2018, p. 22) and Paco and Oliveira (2017, p. 119) did not explore the power of specific motivators such as Twitter hashtags or Instagram publications. The theory of reasoned action further assumes that consumer behaviours are affected by subjective norms and attitudes (Lu and Chen, 2017, p. 351). The first factor represents the personal beliefs regarding the consequences or purchasing a product or a service. At the same time, they are moderated by subjective social norms, opinions of relevant groups, and other normative influences. In the case of beauty products, marketers present the ‘ideal outcome’ in the form of visual materials demonstrating beautiful models and celebrities in order to convince consumers to experience these brands. However, the use of external influencers could also produce unexpected effects on behavioural intentions of customers (Audi et al., 2015, p. 275). Specifically, the conveyed marketing message contained the elements of both celebrity image and brand image. If these two dimensions had insufficient fit degree, this could adversely impact brand reputation. Hence, it may be suggested that optimal results are achieved in the cases when prospective consumers already follow the fan pages or blogs owned by the agent of influencer selected for promotional purposes. 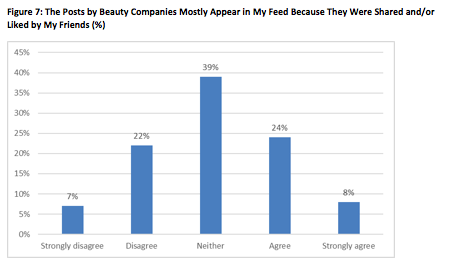 Today, the beauty industry companies are intensely using social media as a marketing vehicle. The 2015 survey by the American Academy of Facial Plastic and Reconstructive Surgery (AAFPRS) found that social media was the main source of information about aesthetical and cosmetics surgery procedures for the youngest customers, or the ‘millennial’ generation (Hilton, 2016, p. 34). Creating the company’s Facebook page to post news there has become a common social media practice in beauty companies from cosmetics retailers to laser surgery clinics (Hilton, 2015, p. 46). However, the industry insiders noted that filling a Facebook page exclusively with the company-created content might be overly time-consuming without delivering the desired outcomes (Hilton, 2015, p. 47). Instead, the companies should engage their customers or patients to share their experiences as peer-spread word-of-mouth is generally more trusted by consumers. Considering the mix of social media vehicles to be employed, the industry insiders interviewed by Hilton (2015, p. 47) noted that the more is not necessarily the better. One interviewee commented that the best results could be delivered by focusing on a few select platforms such as Facebook and Twitter (Hilton, 2015, p. 47). Adler (2016, p. 62) reported the case of a cosmetic procedure clinic that built its patient base from scratch using social media as the only marketing vehicle. The company’s presence on the social media, including Facebook, Instagram and YouTube, was very intense, with several new posts every day (Adler, 2016, p. 62). The type of content included personal stories, procedure videos and pictures. Most videos posted by the company were very short, not exceeding 15 seconds (Adler, 2016, p. 63). These snippets provided the audience with a general idea of the procedure and were too short to get boring. Very short videos are generally considered as more compatible with the format of Instagram (Adler, 2016, p. 63), so adopting them demonstrated the company’s willingness to adapt to the tastes of local audiences on various social media platforms. Moro et al. (2016, p. 3341) found that status postings were the most efficient strategy for the focus cosmetics company to engage users on Facebook. Engagement was measured as the number of likes, comments, shares or clicks. The strongest influencing factor was the content type, which accounted for 36% of variance in the dependent variable (Moro et al., 2016, p. 3347). Status postings elicited twice as much engagement as photos, videos or links (Moro et al., 2016, p. 3347), which challenges the findings by a number of past researchers that photos and videos were the most engaging types of content on Facebook (Taylor and Alonso, 2014, p. 247; Touchette et al., 2015, p. 112). The next influencing factor, accounting for 17% of variance, was the total number of ‘likes’ (Moro et al., 2016, p. 3347), which suggests the existence of a cumulative engagement effect. The findings by Moro et al. (2016, p. 3341) are especially relevant in the content of this project as they were obtained from the study of a Facebook page of a beauty industry company. However, this investigation was a case study and the results contradict the content type-engagement relationship that is supported by a stronger body of empirical evidence. Therefore, future research is needed to find out whether status will be the most engaging type of content in other beauty industry companies as well. The social media strategies of four leading European brands of organic cosmetics were examined side by side in the research project by Fourati-Jamoussi (2015, p. 125). All focus companies employed a mix of Facebook, Twitter, beauty blogs and specialised forums, but in varying proportions. The strongest overall presence on social media was established by Yves Rocher Bio that had over 663,000 ‘likes’ on Facebook, 7,495 followers on Twitter and 596 posts in forums (Fourati-Jamoussi, 2015, p. 129). The researcher also found that at the time of the study, Yves Rocher was among the five most discussed organic beauty brand on the web, but it ranked only tenth in the industry in terms of advertising spending (Fourati-Jamoussi, 2015, p. 127). The contrast between these rankings implied that the brand’s social media strategy was overall more effective as compared with its major competitors, delivering greater customer engagement at smaller cost. These findings support Dehghani and Tumer’s (2015, p. 597) conclusion about high engagement as both an outcome and a facilitator of enhanced brand equity on social media. However, Fourati-Jamoussi (2015, p. 125) did not establish the relationship between customer online engagement and purchase intention for the focus companies, which limits the practical implications of the study. Besides, all sampled brands were from the organic cosmetics field, which is a specific niche market that might require different marketing approaches than mainstream beauty products. Considering the use of beauty blogs as a promotional vehicle in Fourati-Jamoussi’s (2015, p. 125) sample of organic cosmetics companies, Dr. Hauschka and Nivea were the leaders. Each brand was discussed in 22 beauty blogs, while for Yves Rocher this figure was only 15 (Fourati-Jamoussi, 2015, p. 129). Still, Dr. Hauschka elicited a much greater amount of user comments than Nivea, with the proportion of positive comments being greater as well (Fourati-Jamoussi, 2015, p. 129). These findings align with Wang’s et al. 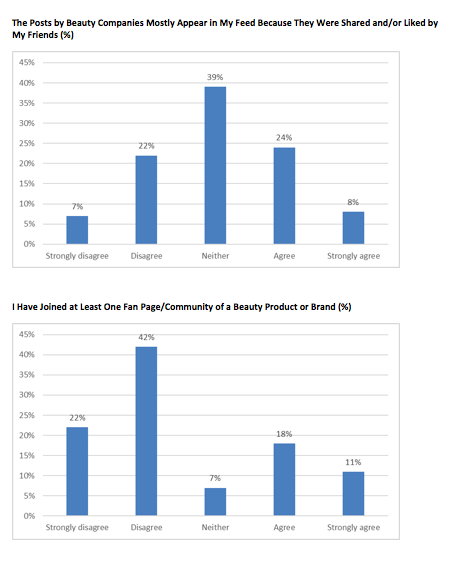 (2015, p. 537) discovery that the marketing outcomes of advertising in beauty blogs can vary greatly according to each blogger’s informational influence and perceived credibility. One can assume that Dr. Hauschka was more accurate and selective in the choice of beauty bloggers to collaborate with, which promoted better customer outcomes at a comparable rate of spending. However, this assumption was not tested by Fourati-Jamoussi (2015, p. 125) empirically as the researcher did not measure the relative contribution of each social media strategy or vehicle to overall customer engagement. This is one major limitation of Fourati-Jamoussi’s (2015, p. 125) work. This dissertation aims at addressing this research gap by establishing a quantified impact of various social media strategies on purchase intention. Another social media strategy that was proven to be effective for targeting millennials is using hashtags on Twitter (Packer-Tursman, 2015, p. 24). However, there is still little research on using hashtags on Instagram, which is currently the most rapidly growing SNS (Sheldon and Bryant, 2016, p. 89). This research project aims at bridging this research gap by comparing the effectiveness of Twitter and Instagram hashtags in the beauty industry context. The study of Audrezet et al. (2018, p. 27) revealed that consumers in the beauty industry were largely motivated by the passionate authenticity and transparent authenticity elements. The first phenomenon is related to the perceived sincerity of influence agents. Customers had to believe that a certain celebrity can be trusted and is primarily motivated by the intention to share valuable information rather than private commercial interests. The transparency element related to the openness of data regarding product contents, unique benefits, and characteristics. The findings suggested that beauty blogs had a generally higher impact than celebrity re-tweets due to their in-depth analysis. However, the findings of Dessart et al. (2015, p. 28) indicated that the engagement of consumers could be limited to emotional and cognitive aspects without stimulating affective purchase decisions. They may be attracted by the materials published by brands on their platforms within the scope of the ‘pull’ marketing paradigm without instantly ordering the discussed items or services. Unfortunately, this study did not compare multiple platforms and communication channels in terms of their capability to stimulate desired consumer reactions, which is performed in this dissertation. Koshy and Manohar (2017, p. 71) performed the analysis of 200 Indian consumers and discovered that the quality of advertisements and the existence of electronic word-of-mouth could stimulate purchase decisions among young customers. At the same time, the products explored in this study were face care items priced at mass-market levels. These limitations indicate that the findings of these researchers may not retain their relevance in other categories of beauty items. Finally, Zain et al. (2018, p. 101) identified that social media platforms including Instagram were increasing their effectiveness due to the global spread of portable mobile devices. As opposed to traditional blogs or advertisements, they presented instant marketing communication and greater engagement. While this study has a relatively small sample, its results conform the concerns of Wang et al. (2015, p.537). This suggested the need to compare the current relevance of these elements in the Analysis of Findings section. The review of secondary literature has identified a range of social media strategies and practices that are employed by beauty industry companies in the effort to grow their business. 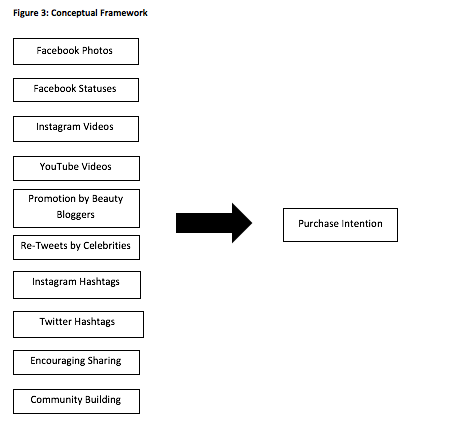 The relationship between these strategies and consumer purchase intention is presented in the figure below. 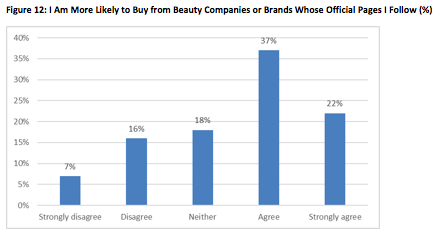 As the figure above demonstrates, the beauty industry companies have a broad choice of strategies that can enhance consumer purchase intention. Six out of eight strategies are linked to the specific social media platforms such as Facebook, YouTube, Instagram and Twitter. Their common feature is creating the company’s official page or account on the SNS and regularly updating it with new content. However, the types of content to be posted are determined by the technological architecture and user preferences of each platform. For example, YouTube would only let the company post video content and Instagram would accept photos and very brief (up to 15 seconds) videos. The common problem with this kind of strategies is that they can be rather time-consuming and laborious in implementation (Hilton, 2015, p. 47; Stelzner, 2011, p. 5). Thus, the strong evidence of their positive impact on purchase intention for a particular beauty company is needed to continue investing in them. Besides, the evidence on the comparative effectiveness of particular content types within a single platform is somewhat contradictory. For example, there is unresolved controversy on whether photos or statuses are the most engaging type of content on Facebook (Moro et al., 2016, p. 3347; Taylor and Alonso, 2014, p. 247). This research project contributes to resolving this debate by comparing the impact of these content types side by side within the beauty industry. The four remaining strategies can be used on any platform or a mix of them. The company can hire a beauty blogger or a celebrity to advertise the product or service on their social media pages. These strategies are generally costly, but they can deliver enhanced customer outcomes because of the advertiser’s large audience and high perceived credibility (McCormick, 2016, p. 43; Wang et al., 2015, p. 537). The two other strategies, encouraging e-WOM and community building, are more accessible, but also involve a higher risk as most of the promotional effort is delegated to customers. Besides, the ability of these strategies to deliver significant improvements in purchase intention is challenged by a number of recent studies (Chang and Cheng, 2016, p. 1; Kim et al., 2016, p. 42). This research project attempts at resolving this controversy by establishing and comparing the impact of these strategies on purchase intention in the beauty industry context. The research objectives set by this project imply the need to collect the customer insights regarding the effectiveness of various advertising strategies used by beauty companies on social media. The large number of identified factors suggested the exclusion of unstructured interviews and other qualitative methods (Neelankavil, 2015, p. 160). These instruments require substantial time and costs to utilise, which limits the overall sample size and generalisability. Additionally, the researcher sought to collect the data on customer behaviours in a highly structured manner to minimise bias. These intentions require the philosophical choice of epistemology (Cassell et al., 2017, p. 159). Alternative philosophies were discarded due to their primary focus on individual values, multiple perceptions of reality, or personal preferences of the respondents. The selected course of research further suggested the use of the positivist paradigm and the quantitative approach as the methodological elements promoting high objectivity (Jason and Glenwick, 2016, p. 121). They allowed the researcher to build reliable generalisations on the basis of observing the large sample of the respondents and registering their behaviours. As the field of consumer purchase motivations has been subject to extensive research in the recent decades, this dissertation adhered to the deductive approach (Pruzan, 2016, p. 99). This strategy does not allow the researcher to produce new theories but makes the data collection process more straightforward and predictable. It also supported other methodological choices, namely the use of the quantitative approach within the scope of the positivist paradigm for promoting objectivity (Halperin and Heath, 2016, p. 26). H1: Being exposed to Facebook statuses by beauty companies will significantly and positively affect the purchase intention in customers. H2: Being exposed to YouTube videos by beauty companies will significantly and positively affect the purchase intention in customers. H3: Being exposed to the beauty bloggers’ postings about beauty companies will significantly and positively affect the purchase intention in customers. H4: Being exposed to e-WOM/s-WOM about beauty companies will significantly and positively affect the purchase intention in customers. H5: Being exposed to Facebook postings will affect the purchase intention in customers more significantly as compared with the postings on Instagram or YouTube. H6: Being exposed to the beauty bloggers’ postings will affect the purchase intention in customers more significantly as compared with any types of content directly posted by the company. 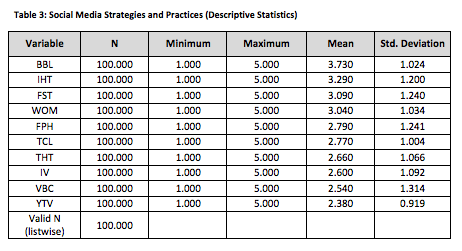 For the purposes of strategic analysis, the variables are coded as shown in the table below. As the table above demonstrates, this research project has 10 independent variables and 2 dependent variables. The multi-factor linear regression model is developed separately for each dependent variable and including all independent variables. The quantitative approach suggested the use of the survey method of data collection (Bryman and Bell, 2015, p. 240). It provides for quick data collection and is convenient for both the researcher and the participants. The questionnaire included 22 questions in 4 sections exploring respondent profiles, social media strategies, strategy-specific purchase intentions, and general purchase intentions. The sample included 100 respondents, which allowed the researcher to apply statistical data processing methods and build reliable generalisations to the whole studied population (Ahn et al., 2014, p. 2). A multiple regression model was built in SPSS to study the influence of 10 independent variables on 2 dependent ones (past and future purchase intentions). To ensure higher reliability, all findings were triangulated with the results of the studies explored at the Literature Review level (Pettey et al., 2017, p. 31). The age distribution of the sample was skewed towards younger groups as shown in the figure below. 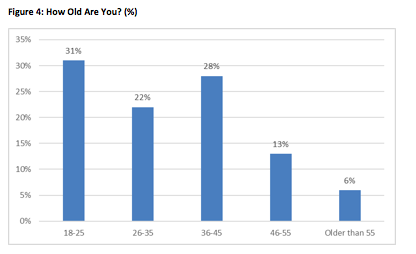 81% of the respondents were aged 45 or younger, and 31% were 18-25 years old. As the figure above demonstrates, the 18-25 age group was the most numerous, accounting for almost a third of the sample. The next largest was the 36-45 group (28% of the respondents). Thus, the survey population was somewhat younger than the average customer of the UK beauty industry, which can be attributed to the fact that younger consumers are overall more active on social media and more likely to follow company pages. 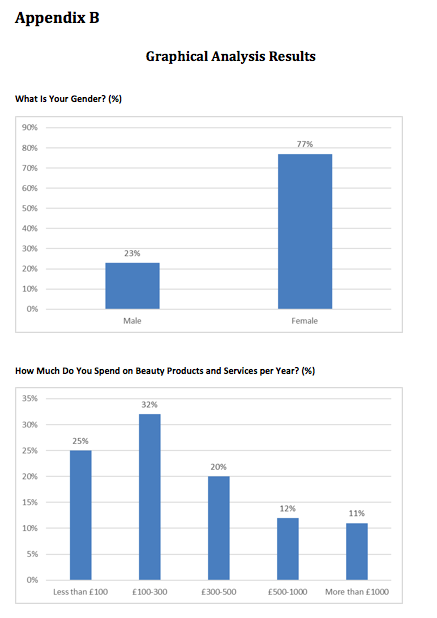 In terms of gender, 77% of the respondents were female and 23% were male (see Appendix B), which is reflective of the beauty industry customers’ being predominantly females. 32% of the sample admitted spending £100-300 per year on beauty products and services, and other 20% spent £300-500 (see Appendix B). On the other hand, 25% of the survey participants reported spending less than £100 for beauty products and only 11% spent more than £1000. Thus, the annual beauty budgets of 57% of the sample were smaller than the UK average, which was estimated by Raconteur (2015, p. 1) at £342.90. This discrepancy can be explained by the respondents’ younger mean age as younger population groups tend to have smaller earnings and would allocate a smaller proportion of their budgets to beauty products. The popularity of various SNSs among the survey participants is presented in the figure below. As the figure above demonstrates, Facebook was found to be the most popular SNS with the survey participants. 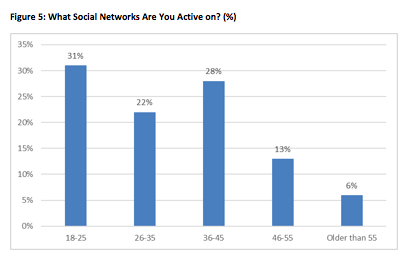 83% of the respondents admitted being active on it. Instagram followed with 61% of the sample, which reflects the rapidly growing popularity of this networking website (Sheldon and Bryant, 2016, p. 89). Twitter ranked third with only 38% of the respondents, and YouTube was actively explored by 27%. Besides, 13% of the survey population ticked all four major SNSs as the places of their activity and 11% reported using other social networking websites. Overall, one can conclude that the majority of the survey participants were avid users of social media, being active on more than one SNS, which is consistent with the purpose of this research. This conclusion is also supported by the data on the average amount of time spent on social media, which is presented in the figure below. 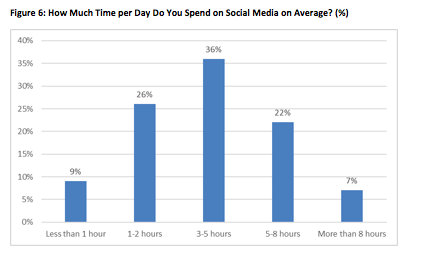 As the figure above demonstrates, the largest proportion of the respondents (38%) reported spending 3-5 hours on social media per day. The next largest group (26%) used social media for 1-2 hours daily and 29% of the sample devoted more than 5 hours to social media. Therefore, the respondents had enough time to notice and appraise the news published by their followed beauty companies on social media. The second part of the survey (Questions 6-15, see Appendix A) enabled the researcher to identify the social media advertising strategies and practices to which the respondents were exposed most frequently. The descriptive statistics for all independent variables is presented in the table below. As the table above demonstrates, the most frequently encountered kind of social media advertising were the recommendations by beauty bloggers (BBL). The mean for this variable was 3.73, which means that the majority of respondents agreed with the statement. More specifically, there were 44% of agreements and 23% of strong agreements (see Appendix B), which means that two thirds of the sample reacted favourably to this kind of advertising. The standard deviation for this variable was one of the smallest, indicating a low dispersion of responses. The next two strategies that were noted by the respondents most often are Instagram hashtags and Facebook statuses. The means of these variables demonstrate that the majority of survey participants were either neutral or positive about them. 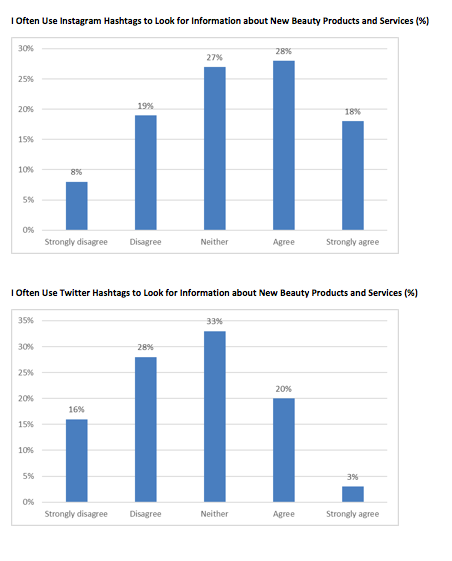 In particular, 46% of the sample admitted using Instagram hashtags to search for new beauty products and the same number would read the new statuses of beauty companies in their Facebook feed (see Appendix B). However, the standard deviation of FST was somewhat higher, indicating a greater number of negative responses. The word-of-mouth was ranked fourth, eliciting the greatest proportion of neutral responses. The mean of this variable was the closest to 3, which corresponds with the neutral alternative. As shown in the figure below, 39% of the respondents could neither agree nor disagree with the statement. The possible explanation is that many users are subscribed to the same beauty companies as their friends, so it is difficult to tell whether a particular post appeared in the feed directly from the company or due to being shared by friend. As shown in the figure above, the respondents split almost equally in those who agreed or strongly agreed with the statement and those who disagreed or strongly disagreed. Nevertheless, the number of agreements was slightly greater at 32%, indicating that this social media strategy can still be effective to reach almost every third customer. Facebook photos were ranked two positions lower than statuses, with the mean of 2.79 indicating that most respondents either disagreed or were neutral. This finding supports the conclusion by Moro et al. (2016, p. 3347) that statuses are a more engaging type of Facebook content as compared with photos. The smallest number of agreements was elicited by the question measuring the sample’s response to YouTube videos by beauty companies. The mean was 2.38, showing that most of the survey participants either did not see these videos or were not willing to watch them. Thus, this social media strategy might not be not particularly effective for beauty companies to employ. The standard deviation was the smallest among all variables, which means that the sample was rather homogenous with respect to this variable. Actually, there were 59% of negative and 32% of neutral responses (see Appendix B). By contrast, the largest standard deviation was observed in the virtual brand community (VBC) variable, which is an indicator of highly polarised attitudes as shown in the figure below. As the figure above demonstrates, the question about virtual community participation elicited a very low number of neutral responses. Although the vast majority (64%) either agreed or disagreed with the statement, 29% of the sample admitted being involved in fan communities. Therefore, this strategy can be effective to reach about one third of the customer audience. Five questions were included in the survey to measure the consumer purchase intention that was elicited by specific social media strategies, including s-WOM, beauty blogger promotion, celebrity re-tweets, Facebook postings and virtual brand communities. The distribution of answers for word-of-mouth purchase intention is presented in the figure below. 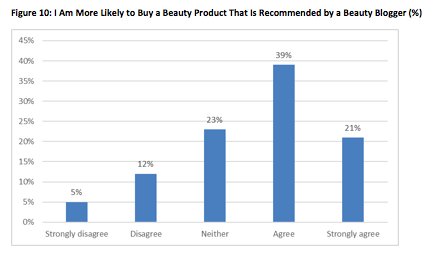 As the figure above demonstrates, 41% of the respondents were more likely and 26% were much more likely to purchase a beauty product when it was recommended to them by their friend. Overall, positive WOM appeared to be significant to two thirds of the sample in their decision-making, which indicates the high level of trust that British customers have for friend recommendations. This result aligns with the findings obtained in a number of past research studies across geographical and industrial contexts (Erkan and Evans, 2016, p. 47; See-To and Ho, 2014, p. 182; Teng et al., 2014, p. 746). 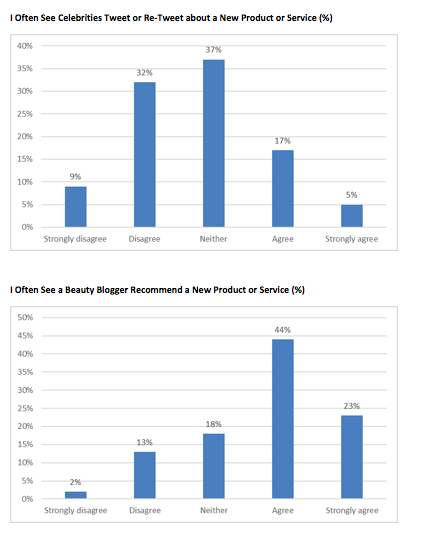 The trust for the recommendations by beauty bloggers was somewhat lower as shown in the figure below. 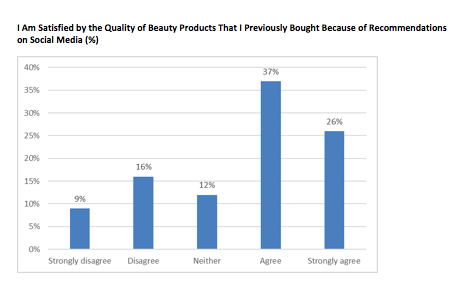 As presented in the figure above, 60% of the respondents were willing or strongly willing to purchase the product that was promoted by a beauty blogger and other 23% were not sure. This finding agrees with what was reported by Fourati-Jamoussi (2015, p. 129) and Wang et al. (2015, p. 537) about the considerable power of beauty bloggers to influence the attitudes of their audience towards cosmetic products. Still, the identified proportion of customers who would rely on a beauty blogger’s review was considerably smaller than in the research study by BuzzMyVideos (2015, p. 1) where it reached 85%. One possible reason for such a discrepancy is that the BuzzMyVideos (2015, p. 1) survey was focused on YouTube beauty bloggers and avid YouTube users, while in this research project only 27% of the respondents admitted being active on YouTube (see Appendix B). Thus, one can conclude that the customer outcomes of beauty blogger promotions on other social networks might be smaller than on YouTube, but still significant. The informational influence of celebrities was found to be much smaller than that of beauty bloggers as demonstrated in the figure below. As the figure above shows, only 39% of the survey participants admitted they were more willing to buy a product recommended by a celebrity. The number of neutral responses was almost as large at 35%. 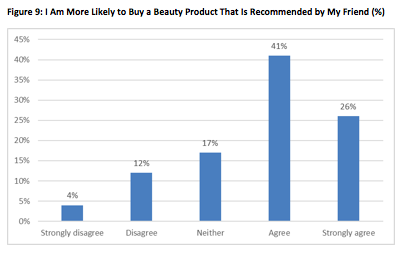 The significant proportion of the respondents who could not make up their mind indicates that the effect of a celebrity promoting a beauty product can greatly depend on the celebrity type and perceived fit with the product, in accordance with the findings by McCormick (2016, p. 43). The obtained ratio of those who were affected by celebrity advertising in this survey is somewhat smaller than what was established by McCormick (2016, p. 43) in the earlier study. This discrepancy can be attributed to the fact that McCormick (2016, p. 43) focused on millennial customers who comprised only 31% of the sample in this research project. These findings indicate that the effect ofevo celebrity re-tweets might be more significant for the younger age groups and highly dependent on the contexts, such as the perceived celebrity-product fit and the customer’s familiarity with this person. The impact of following the company’s Facebook page on purchase intention is presented on the figure below. As the figure above demonstrates, 37% of the sample agreed and 22% strongly agreed they were more likely to buy from the companies whose official pages they follow. This distribution of responses aligns with the findings by Dehghani and Tumer (2015, p. 597) who established customer engagement with the company’s content on Facebook as a significant predictor of purchase intention. Meanwhile, the survey results contrast with the observations by Coursaris et al. (2016, p. 3546) who established no significant relationship between customer engagement on Facebook and their purchase intention. One possible reason behind this discrepancy is the specifics of the beauty industry where social media have already become the most important source of information about new products and services for customers (Immediate Future, 2016, p. 1). None of the brands investigated by Coursaris et al. (2016, p. 3546) belonged to the beauty industry, and this survey was focused on the beauty companies only. Still, the impact of following a company’s fan page was much different as shown in the figure below. As presented in the figure above, only 29%, or less than a third of the respondents reported willingness to buy from the companies whose fan pages they follow. The number of negative responses was significantly greater at 48%, or almost a half of the sample. This distribution might be related to a small proportion of survey participants who were part of at least one fan community. Responding to Question 15, only 29% of the respondents agreed that they have joined at least one such community (see Section 4.2.1. 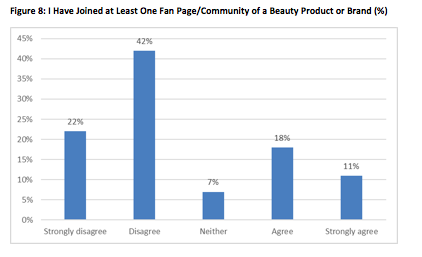 ), which exactly matches the ratio of participants who were willing to purchase the products advertised on fan pages. Thus, one can conclude that engagement with a fan page is a strong predictor of purchase intention, but this form of engagement is not much widespread in British customers. Overall, the strong purchase intention in the customers involved in fan communities agrees with the findings by Chang and Cheng (2016, p. 1). Separate regression models were developed for the customer purchase intention in the future and the customer purchase intention in the past, which was manifested in actual purchasing behaviours. 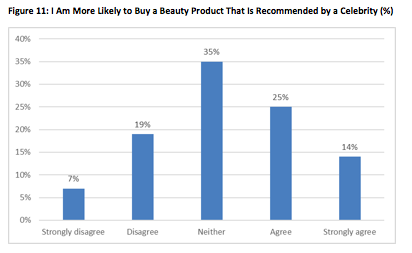 Future purchase intention was measured as the respondents’ current consideration of buying any beauty product or service. The linear regression model of the future purchase intention is presented in the table below. 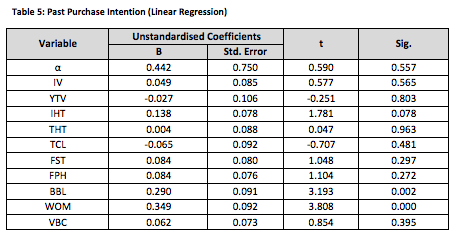 As the table above demonstrates, three out of ten independent variables were statistically significant at the 0.005 level. These variables are Facebook statuses (FST), Instagram hashtags (IHT) and YouTube videos (YTV). The relationship between each of them and the dependent variable was positive, indicating that they were strong predictors of customer purchase intention. The whole model was significant at the 0.001 level and explained 54.6% of variance in the purchase intention, which indicates its high reliability and validity. The results of this linear regression provide support for Hypothesis 1 and Hypothesis 2, establishing the exposition to Facebook statuses and YouTube videos as significant and positive predictors of consumer purchase intention. The high significance of the IHT variable can be attributed to the fact that using Instagram hashtags to look for beauty products is already a manifestation of high purchase intention. The customers are more likely to browse for products by hashtags when they are considering a purchase, not out of pure curiosity. However, no comparable statistical significance was established for the Twitter hashtags variable (THT). One possible explanation is the higher popularity of Instagram among the survey participants. As discussed in Section 4.1., Instagram was actively used by 61% of the respondents, while for Twitter this figure was only 38%. The customers who are not active on Twitter, which constitute more than 60% of the sample, are unlikely to use Twitter hashtags either, which contributed to the weak relationship between this variable and future purchase intention. Another potential reason is that Twitter hashtags might be already overused by beauty companies, which makes it more difficult for customers to find the offers that are of greatest interest to them. This effect might be less distinctive on Instagram because of the younger age of this social network and smaller number of companies making use of it. Exposition to Facebook photos (FPH), unlike Facebook statuses, was not established as a significant predictor of purchase intention, which agrees with the observations by Moro et al. 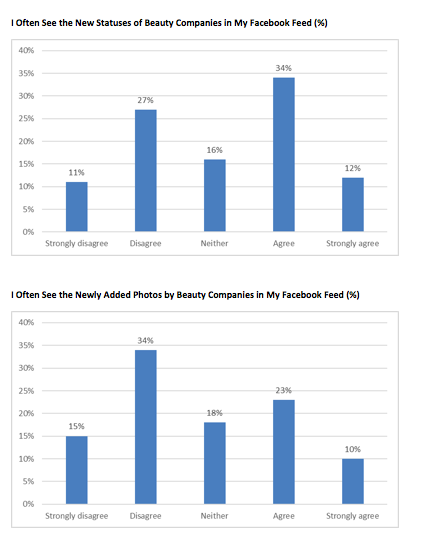 (2016, p. 3341) that statuses were twice as much effective for customer engagement with a beauty company than photos. Besides, the high significance of FST supports the findings by Dehghani and Tumer (2015, p. 599) about the considerable power of Facebook advertising to promote purchase intention. However, Dehghani and Tumer (2015, p. 599) did not test the impact on purchase intention by the types of Facebook content, which limits the comparability of their results with those of this survey. One possible reason that the strong relationship with purchase intention was established only for status postings and not for photos is that statuses are used by beauty companies more frequently to inform about discounts, bargains and special offers, which might provoke a spontaneous purchase. Moreover, if the company publishes such offers regularly, it can motivate the customers to keep following its Facebook page and pay attention to status updates. Meanwhile, this attention might not be transferrable to photo content that is published by the same company. The study by Moro et al. (2016, p. 3341) reported significant gaps in the customer engagement across different types of Facebook content by the same beauty brand. The identification of YouTube videos as the third significant predictor of purchase intention is somewhat counterintuitive, considering the low mean value that was given to this variable by the survey respondents (see Section 4.2.1.). 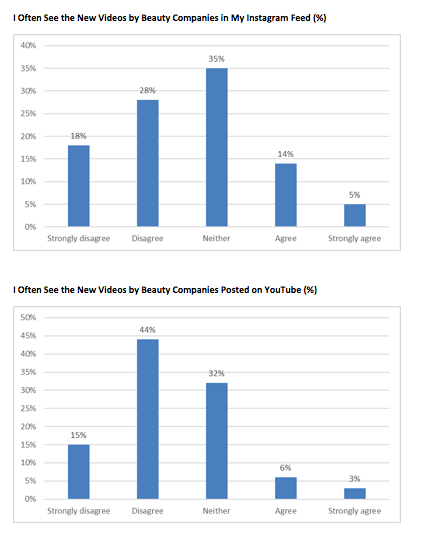 More specifically, only 9% of the participants liked to watch the new videos by beauty companies on YouTube, while 32% were neutral and 59% reported a negative attitude (see Appendix B). This apparent contradiction might be explained by the fact that videos, especially longer ones, demand a higher amount of the customer’s time and attention than other advertising formats such as Facebook postings or photos. Thus, the customers might be willing to invest this time only when they are looking for a specific product and already interested in buying it. 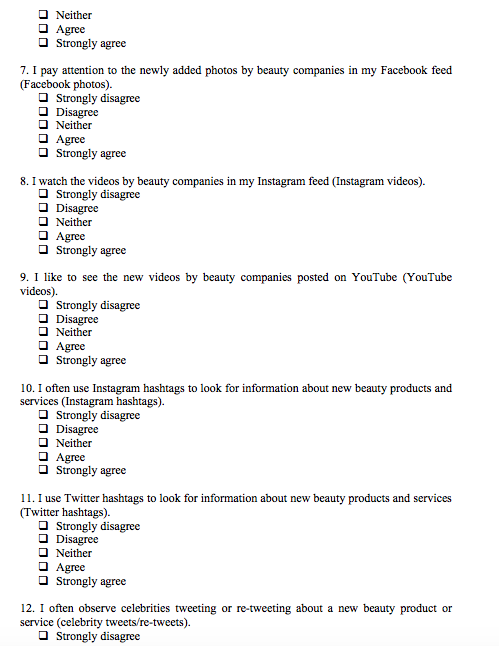 In particular, the neutral responses given by a third of the sample might be interpreted as their willingness to watch videos about beauty products only when they are seriously considering a purchase. Thus, engagement with videos might be a strong predictor of customers’ purchase intention, although not particularly effective in generating it from scratch. Videos might facilitate purchase by providing extra information about the product that the customer is already aware of and willing to buy. For this reason, the potential of YouTube videos should not be disregarded by beauty companies, despite their apparently smaller reach as compared with most other social media strategies. Instagram videos (IV) were not established as a significant predictor, which indicates that they might be less effective in promoting customer purchase intention than YouTube videos. Part of this discrepancy can be attributed to the time limit of 15 seconds for the videos being uploaded to Instagram, which might not be sufficient to show the advantages of the beauty products or services. 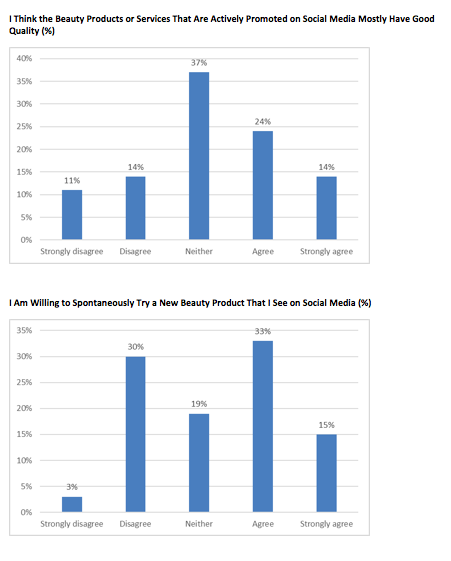 Past purchase intention was measured as the respondents’ having purchased any beauty products of which they learned from social media within the past six months. 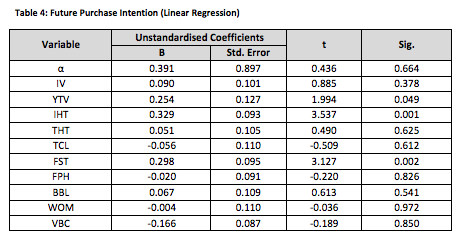 The linear regression model of the past purchase intention is presented in the table below. As the table above shows, two out of ten independent variables were found to be statistically significant at 0.005, namely promotions by beauty bloggers (BBL) and social word-of-mouth (WOM). The other variables were not statistically significant and, hence, could not be used to predict the past purchase intention. The relationship of the dependent variable with BBL and with WOM was positive, which means that these social media strategies promoted the purchase intention. The whole model was significant at 0.001 and explained 55% of variance in the dependent variable. The results of this linear regression provide support for Hypothesis 3 and Hypothesis 4. 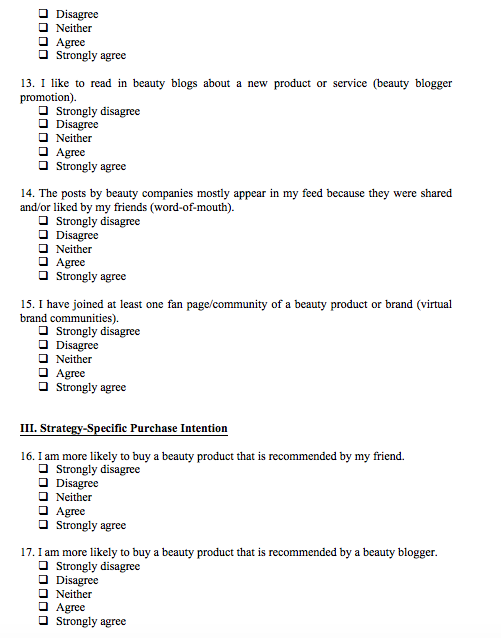 The high significance and positive effect of WOM and beauty blogger promotion could be expected, given the high rankings of these independent variables according to the survey results (see Section 4.2.1.). Besides, the importance of positive WOM as a predictor of purchase intention aligns with a number of past research studies (Brinda and Shabu, 2016, p. 1; Dehghani and Tumer, 2015, p. 599; Fourati-Jamoussi, 2015, p. 129; Lu et al., 2016, p. 225). The prominent role of beauty blogger promotion agrees with the investigations by BuzzMyVideos (2015, p. 1) and Wang et al. (2015, p. 537). Meanwhile, the celebrity re-tweet variable (CLT) was not significant, indicating the smaller effectiveness of this social media advertising strategy as compared with s-WOM or collaboration with beauty bloggers. The identification of beauty blogger promotion and YouTube videos as significant predictors of purchase intention, although in different models, implies that the format of video beauty blogs (vlogs) might be particularly effective in this industry. Interestingly, the two significant predictors identified for the regression model of past purchase intention were completely different from those identified in the regression model of future purchase intention. No independent variable was established as significant in both these models. The reason behind this situation might be related to the varying consumption patterns in the different groups of customers according to their preferred social media. More specifically, the customers who mostly trust their friends and beauty bloggers would buy all beauty products they need seldom and in large quantities. 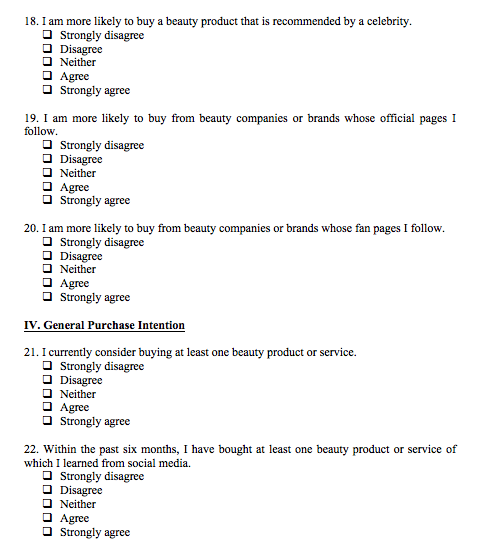 Thus, they were likely to give a negative response to Question 21 (“I currently consider buying at least one beauty product or service”) and a positive response to Question 22 (“Within the past six months, I have bought at least one beauty product or service of which I learned from social media”). By contrast, the consumers who were more affected by Facebook and Instagram advertising tended to be more spontaneous in their behaviours. They would buy beauty products more often, but easily forget these purchases afterwards, which stipulated their positive responses to Question 21 and negative or neutral responses to Question 22. However, no evidence of such varying consumption styles was presented in any of the past research studies in the beauty industry context, so this explanation should be treated as hypothetical. Another possible explanation is related to the small sample size. Only 100 customers were surveyed in total, and the proportion of those who demonstrated a clear preference for each social media strategy did not exceed 50-60%. Thus, random factors could have significantly affected the distribution of responses considering purchase intention. In other words, the researcher happened to approach the respondents when those who mostly relied on the recommendations by friends and beauty bloggers had made purchases a short time before and needed no new items at the moment. Contradictorily, those participants who were inclined to read Facebook statuses or use Instagram hashtags were mostly in the search of new deals. This coincidence, the effects of which would have been mitigated or eliminated by a larger sample size, interfered with the regression calculations and created the relationships between variables that do not actually exist in the broader population. The possibility of such a data distortion taking place calls for future research on a large customer sample in the UK beauty industry context. The findings have shown that the role of beauty bloggers and social word-of-mouth in the online environment has decreased, which supports the concerns of Wang et al. (2015, p. 537). At the same time, only three communication channels, namely Facebook statuses, Instagram hashtags, and YouTube videos were viewed as relevant for future purchase decisions. These results provide important insights into current consumer decision-making patterns and generally conform with the trends recognised by Adler (2016, p. 62) and Hilton (2016, p. 34). The fact that 39% of the studied samples were not willing to purchase beauty products on the basis of celebrity recommendations further suggests that this costly promotional method should be used with caution (McCormick, 2016, p. 43). It can also be noted that the identified controversy between the high share of negative attitudes towards YouTube videos and the significance of this element for consumer decision-making may be explained by different roles of the three identified communication channels. While Instagram hashtags and Facebook statuses may be valuable for forming new needs or searching for relevant information, in-depth video-reviews may be used sparingly to finalise the purchase decisions and limit the list of alternatives. Objective 1 was to evaluate how consumer behaviour theories explain the connection between social media and customer responses. It was identified that this instrument could facilitate consumer decision-making through information-sharing and alternatives evaluation phases (Voramontri and Klieb, 2018, p. 3). Additionally, new consumer needs could be created through effective word-of-mouth or beauty bloggers promotion. Objective 2 was to identify the social media strategies/practices employed by companies in the beauty industry. The analysis of available instruments studied by such researchers as McCormick (2016, p. 43) and Packer-Tursman (2015, p. 24) identified 10 key factors including word-of-mouth, celebrity tweets, and beauty bloggers’ publications that could stimulate purchase decisions. Objective 3 was to compare the effectiveness of various social media advertising strategies in promoting consumer purchase intention. Instagram hashtags, Facebook statuses, and YouTube videos were positive predictors of future purchase intentions among the studied consumers. The fact that social word-of-mouth and beauty bloggers’ promotions were significant in the past but had not impact on the previous variable may confirm the change of trends in online marketing during the previous several years noted by Balaji et al. (2016, p. 529). Objective 4 was to develop recommendations for the beauty industry companies on which social media strategies to employ in order to maximise customer outcomes. Specific suggestions are given in the following section. The identified change of consumer preferences suggests that using Facebook, Instagram, and YouTube platforms may be more effective for marketers than the use of blogging platforms or generating social word-of-mouth. A more effective strategy can be realised by increasing the publication frequency through these communication channels and selecting the suitable agents of influence for individual media. The relatively short time-frame of this consumer analysis study did not allow the researcher to employ such methods as unstructured interview and the inductive approach to data analysis. The use of these elements may greatly contribute to the scientific discussion of the topic and increase the understanding of rational and subliminal motivations for making purchase decisions in the beauty industry. Adler, S. (2016) “Redefining the rules for #SocialMediaSuccess”, Dermatology Times, 37 (3), pp. 64-65. Ahn, C., Heo, M. and Zhang, S. (2014) Sample Size Calculations for Clustered and Longitudinal Outcomes in Clinical Research, London: CRC Press. Audi, M., Al Masri, R. and Ghazzawi, K. (2015) “The effect of celebrity endorsement on creating brand loyalty: an application on the lebanese cosmetic sector’s demand”, International Journal of Business Management and Economic Research, 6 (5), pp. 273-287. Audrezet, A., De Kerviler, G. and Moulard, J. (2018) “Authenticity under threat: When social media influencers need to go beyond self-presentation”, Journal of Business Research, 1 (1), pp. 1-56. Balaji, M., Khong, K. and Chong, A. (2016) “Determinants of negative word-of-mouth communication using social networking sites”, Information and Management, 53 (4), pp. 528-540. Beauty Resource (2016) “The history of the beauty industry”, [online] Available at: http://www.beautyresource.org.uk/content/history-beauty-industry.html [Accessed on 20 September 2016]. Brinda, V. and Shabu, J. (2016) “A trustworthy e-WOM in social networks”, 2016 International Conference on Information Communication and Embedded Systems (ICICES), pp. 1-6. Bryman, A. and Bell, E. (2015) Business Research Methods, Oxford: Oxford University Press. BuzzMyVideos (2015) “2015 online video barometer”, [online] Available at: http://www.buzzmyvideos.com/our-survey-reveals-online-video-is-set-to-champion-the-christmas-2015-selling-season-for-beauty-brands/ [Accessed on 20 September 2016]. Cassell, C., Cunliffe, A. and Grandy, G. (2017) The SAGE Handbook of Qualitative Business and Management Research Methods, London: SAGE. Chang, C. and Cheng, W. (2016) “Enhancing purchase intention through social media brand community: the roles of social presence, interactivity, and peer motivation”, Proceedings of the 18th Annual International Conference on Electronic Commerce: e-Commerce in Smart Connected World, pp. 1-7. Coursaris, C., Osch, W. and Balogh, B. (2016) “Do Facebook likes lead to shares or sales? Exploring the empirical links between social media content, brand equity, purchase intention, and engagement”, 2016 49th Hawaii International Conference on System Sciences (HICSS), pp. 3546-3555. CTPA (2016) “Key facts about the cosmetics industry”, [online] Available at: http://www.ctpa.org.uk/content.aspx?pageid=295 [Accessed on 20 September 2016]. Dehghani, T. and Tumer, T. (2015) “A research on effectiveness of Facebook advertising on enhancing purchase intention of consumers”, Computers in Human Behaviour, 49 (1), pp. 597-600. Dessart, L., Veloutsou, C. and Morgan-Thomas, A. (2015) “Consumer engagement in online brand communities: a social media perspective”, Journal of Product & Brand Management, 24 (1), pp. 28-42. Erkan, I. and Evans, C. (2016) “The influence of e-WOM in social media on consumers’ purchase intentions: an extended approach to information adoption”, Computers in Human Behaviour, 61 (1), pp. 47-55. Euromonitor (2016) “Beauty and personal care in the United Kingdom”, [online] Available at: http://www.euromonitor.com/beauty-and-personal-care-in-the-united-kingdom/report [Accessed on 20 September 2016]. Fourati-Jamoussi, F. (2015) “E-reputation: A case study of organic cosmetics in social media”, 2015 6th International Conference on Information Systems and Economic Intelligence (SIIE), pp. 125-132. Habia (2016) “Hair and beauty industry overview”, [online] Available at: http://www.habia.org/industry/overview [Accessed on 20 September 2016]. Halperin, S. and Heath, O. (2016) Political research: methods and practical skills, Oxford: Oxford University Press. Hilton, L. (2015) “Three fast marketing tactics for lasers”, Dermatology Times, 36 (12), pp. 46-47. Hilton, L. (2016) “Should you use neurotoxins on your millennial patients?”, Dermatology Times, 37 (7), pp. 33-34. Immediate Future (2016) “The influence social media has on the beauty industry just grows and grows”, [online] Available at: http://immediatefuture.co.uk/blog/the-influence-social-media-has-on-the-beauty-industry-just-grows-and-grows/ [Accessed on 20 September 2016]. Kim, Y., Dwivedi, R., Zhang, J. and Jeong, S. (2016) “Competitive intelligence in social media Twitter: iPhone 6 vs. Galaxy S5”, Online Information Review, 40 (1), pp. 42-61. Koshy, L. and Manohar, S. (2017) “Factors Influencing the Buying Behaviour of Face Care Products Among Youth”, International Journal in Management and Social Science, 5 (1), pp. 63-72. Licensemag (2016) “10 YouTube creators to watch”, License Global, 19 (3), pp. 151-156. Lu, Y. and Chen, K. (2017) “Consumer Knowledge, Brand Image, Openness to Experience and Involvement: A Case in Cosmetic Consumption”, Journal of Cosmetics, Dermatological Sciences and Applications, 7 (4), pp. 349-361. McCormick, K. (2016) “Celebrity endorsements: influence of a product-endorser match on millennials’ attitudes and purchase intentions”, Journal of Retailing and Consumer Services, 32 (1), pp. 39-45. Miguel, J. (2014) “Beauty brands and social media”, [online] Available at: http://www.socialmediatoday.com/content/beauty-brands-and-social-media [Accessed on 20 September 2016]. Moro, S., Rita, P. and Vala, B. (2016) “Predicting social media performance metrics and evaluation of the impact on brand building: a data mining approach”, Journal of Business Research, 69 (9), pp. 3341-3351. Morrill, H. (2016) “An analysis of Brexit’s impact on the beauty industry”, [online] Available at: http://www.allure.com/story/brexit-impact-on-beauty-industry [Accessed on 20 September 2016]. Neelankavil, J. (2015) International Business Research, New York: M.E. Sharpe. Packer-Tursman, J. (2015) “Marketing to millennials”, Managed Healthcare Executive, 25 (9), pp. 23-24. Paco, A. and Oliveira, S. (2017) “Influence Marketing in the Fashion and Beauty Industry”, Estudos em Comunicação, 1 (25), pp. 119-136. Pettey, G., Bracken, C., Pask, E. and Babin, E. (2017) Communication Research Methodology: A Strategic Approach to Applied Research, New York: Taylor & Francis. Pruzan, P. (2016) Research Methodology: The Aims, Practices and Ethics of Science, Berlin: Springer Science & Business Media. Raconteur (2015) “The beauty economy”, [online] Available at: http://raconteur.net/the-beauty-economy-2015 [Accessed on 20 September 2016]. Retail Economics (2016) “UK retail sector – health and beauty”, [online] Available at: http://www.retaileconomics.co.uk/retail-sector-health-and-beauty-market [Accessed on 20 September 2016]. See-To, E. and Ho, K. (2014) “Value co-creation and purchase intention in social network sites: the role of electronic word-of-mouth and trust – a theoretical analysis”, Computers in Human Behaviour, 31 (1), pp. 182-189. Sheldon, P. and Bryant, K. (2016) “Instagram: motives for its use and relationship to narcissism and contextual age”, Computers in Human Behaviour, 58 (1), pp. 89-97. Statista (2016) “Market value of beauty and personal care in the United Kingdom (UK) from 2011 to 2016 (in million euros)”, [online] Available at: https://www.statista.com/statistics/491298/beauty-and-personal-care-united-kingdom-uk-market-value/ [Accessed on 20 September 2016]. Stelzner, M. (2011) “Social media marketing industry report: how marketers are using social media to grow their businesses”, [online] Available at: https://www.socialmediaexaminer.com/SocialMediaMarketingReport2011.pdf [Accessed on 20 September 2016]. Taylor, K. and Alonso, O. (2014) “Insights from brands in Facebook”, Proceedings of the 2014 ACM conference on Web science, pp. 247-248. Teng, S., Wei Khong, K., Wei Goh, W. and Yee Loong Chong, A. (2014) “Examining the antecedents of persuasive e-WOM messages in social media”, Online Information Review, 38 (6), pp. 746-768. Touchette, B., Schanski, M. and Lee, S.-E. (2015) “Apparel brands’ use of Facebook: an exploratory content analysis of branded entertainment”, Journal of Fashion Marketing and Management, 19 (2), pp. 107-119. Voramontri, D. and Klieb, L. (2018) “Impact of social media on consumer behaviour”, International Journal, 462 (1), pp. 1-24. Wang, S., Hsu, C., Huang, H. and Chen, C. (2015) “How readers’ perceived self-congruity and functional congruity affect bloggers’ informational influence”, Online Information Review, 39 (4), pp. 537-555. Zain, M., Perry, P. and Quinn, L. (2018) “The Influence of Fashion Bloggers on the Pre-Purchase Decision for Online Fashion Products among Generation Y Female Malaysian Consumers”, International Journal of Social, Behavioral, Educational, Economic, Business and Industrial Engineering, 12 (1), pp. 101-107.